The word “routine” can sometimes feel like a 4 letter word, and rightfully so depending on how they’re used. But in today’s video we talk about how routines can help us create better habits for ourselves and learn to block off our personal time in order to accomplish our personal goals. In today’s video, I discuss two things my toddler has recently taught me about community through his own little band of brothers. Many times, our default question for conversation is “What’s next?” or some variation of it — we have a natural tendency to steer toward the future when talking to others. I’ve found this question can put people on the spot, though, and realized that learning about their past can be just as effective in developing my relationship with them. It’s happened to all of us – we’re huge fans of a product that suddenly disappears from shelves, never to be found again. We always wonder what happened and why the manufacturer shut it down. About a year and a half ago, my company replaced one of the flavor options in our line of drinks. Few people ever tried the outgoing flavor while doing product samplings. No one ever told us how much they loved that specific flavor. It was just part of the family, along for the ride. Then, when we decided to replace it, people were suddenly leaving comments on our wall, telling us how disappointed they were while at expos, etc. It was baffling. Who knew it was liked by so many? So a question for brand building is, what initiatives and steps are being taken to turn these ardent followers and fans into vocal advocates? What are they saying and doing to get their friends to try and buy? How do we create consumer engagement and brand loyalty early enough that it spreads to a greater population? Having a small group of silent fans who “love” your product isn’t sustainable. They have to become ambassadors. Fortunately, it’s easier than ever to empower people with this opportunity. Unfortunately, it’s more difficult than ever to get people to focus only on you. Engagement is key. Conversation is crucial. If there is something that you need to have done or feedback you’re looking for – just ask. 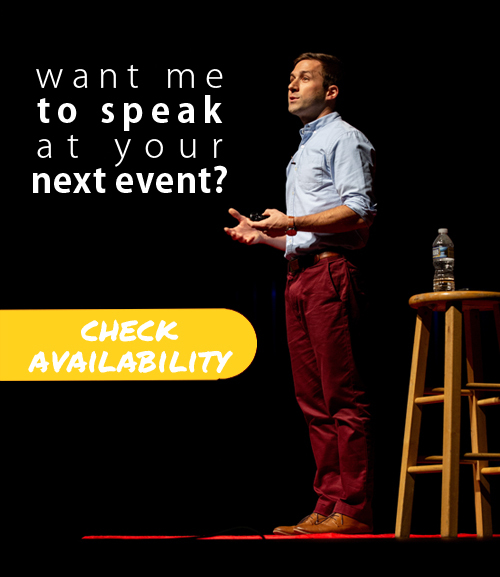 Don’t let your brand be the next Houdini that suddenly disappears from the marketplace. We’re one week into the month of February. Did you have a chance to make a budget back on the 1st? If so, you might be wondering, “What’s the best way to ensure I actually stick to those budgeted numbers?”. I would recommend one of two ways. If you’re familiar at all with Dave Ramsey’s philosophies on getting out of debt and managing your personal finances, you’ll know that he is a huge proponent of the cash envelope system. In this situation, you literally use only cash. Each envelope is labeled with a name, the budgeted amount of money is placed into the envelope, and when the envelope is empty…no more spending for the month. It’s pretty simple. When there is no more money to spend, you’re mathematically guaranteed to not go over your budget! Another option for those more willing to trust technology would be a website like Mint.com. Here, you plug in all of your financial information and link your bank’s savings, checking and/or investment accounts. Mint then keeps track of transactions and balances to view in one dashboard. I was a little hesitant at first, but after reading into it, decided to give them a shot. You can’t physically move money between accounts using Mint, so that made me feel more secure about it; you can only see account activity. The big draw to Mint for me, though, is the budget tracking (example below). You start by entering your income for the month and then all of your planned expenses. 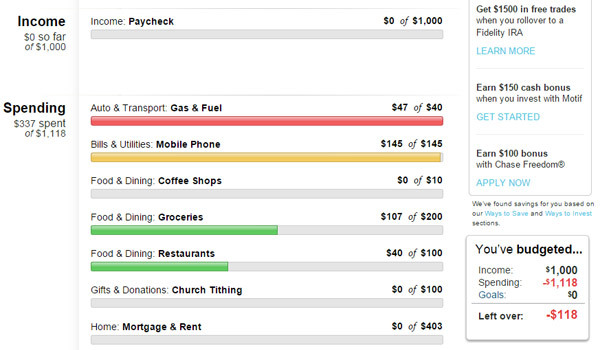 This example shows that I haven’t been paid yet this month, but I’ve over-spent on gas, covered my cell phone bill and am still in the clear with everything else. You can then check the site or the app as often as you like to stay on top of your spending. Or have them automatically send you warnings and weekly summaries to let you know when you’re going over budget. There are a lot of other free budget tracking sites listed in articles like this, so also check those out and see which might work best for you. At the end of the day, it’s all about spending less than you’re bringing home. To track that spending, it’s important to find a method that you both trust and can easily implement – that way you stay on your path to financial success! What method do you currently use to track your spending? How has it helped you stay on budget? Let me know in the comments below! For the last seven days, I’ve made it a point to “ship” something (a blog) every day, regardless of my schedule, how I feel, etc. No excuses. And I’m glad I did, because I think it helped in a few different ways. I’m still green in the world of blogging, so it gave me an opportunity to find other people sharing content I can relate to. I’ll take their personal sites and twitter handles away from this and gladly follow along in their dialogue. It gave me an even greater desire to ship new content. When I have a thought to share, there’s no point in holding it back for the right time – I can just write it up and let it go. I’m now more confident in the fact that I’ll have another thought come along sooner rather than later and be able to ship even more expeditiously. The #yourturnchallenge has also taught me that I still have a long way to go in being able to produce content efficiently. It makes me want to continue streamlining my thoughts to get to the real crux of what I want to say. Becoming a “writer” is going to take lots of edits and re-edits! But the more I ship, the more practice I’ll get. Lastly, I would say that the #yourturnchallenge is another real world example of how a simple idea can create a tribe. So often, I think that it would take a huge infrastructure and all sorts of resources I don’t have. The reality is, technology makes it easier than ever to share your message and find people to follow. Kudos to Winnie! So if you want to change your diet, change your spending habits, change your temper, change your prayer life or change anything…I would like to challenge you to give it a week. Start on a Monday. Work through Sunday. Find a group of people to support you, encourage you and hold you accountable. Anyone can do something for a week! And it won’t be long until the next post is up, so check back often or be sure to subscribe to my email newsletter!